Since the first Ghostbusters Minimates came out, people have wanted one thing: the cute Minimate-ized GB logo from the packaging turned into a real figure. Patience pays off! 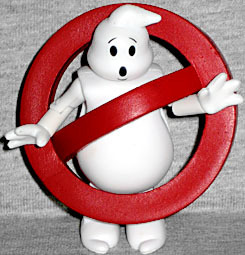 The famous "no ghost" logo was conceived by Dan Akroyd, but was actually designed by art director John DeCuir, Jr. Since the "no" symbol had been around for years, the "conception" part was probably just combining that with a cartoon ghost, and it was the art director who was responsible for the specifics. Logo-y the Logo Ghost doesn't just use the plain Minimate body, because it wouldn't really suit his formless, rounded appearance. He has a new pear-shaped chest cap that stretches all the way down to his knees, where it meets his new booties with their curly little toes. He gets new hands with the fingers splayed, just like the logo had. 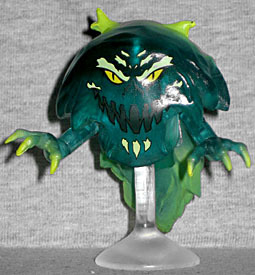 To duplicate the bulbous head with the curlicue on top, there's a piece that slips down over the normal head. 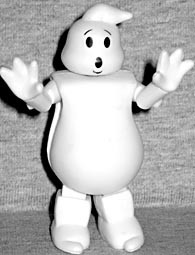 Really, the only visible evidence of the standard body is the arms. You can't see it through the packaging, but Logo-y includes a second head with a different expression: while the normal one has the "oh no" look you see on the logo, the second had a big happy smile. Aww! In the intro to the Real Ghostbusters cartoon, the ghost was seen strutting merrily down the street, so this probably represents that. He has two accessories: there's the No symbol, which is 2⅛" in diameter and has a curved "slash" that rests on Logo-y's belly, rather than attaching to the figure in any permanent way; secondly, there's a small handsaw, a reference to one of the cartoon's bumps. There are also a pair of plain white Minimate hands, so he can hold the saw. Meanwhile, an electrically-charged ghost named "Killerwatt" has taken over the power plant, leaving New York City powerless! I've got only vague memories of The Real Ghostbusters, and Killerwatt isn't among them. He only appeared in one episode, which was named after him, and the plot is pretty much what the back of the packaging says: he feeds on electricity, he caused blackouts in New York... and that's really all there is. He also had an army of ghosts at his command, capable of possessing any electronic devices and bringing them to life. He hovers through the use of one of those flight stands several of the Ghostbusters Minimates have come with, and includes two translucent yellow lightning effects - no clue how they're intended to be used, but we like to put them on his arms to make him look like he's ready to zap someone or something. Fun fact: Killerwatt was voiced by James Avery, who you'll know as Uncle Phil on Fresh Prince, and also as TMNT's Shredder. How about that! Until now, the only way to get a Ghostbusters logo figure was to spend $30 on a real piece of garbage that included it as an accessory - an $8 Minimate set beats that any day! Killerwatt is kind of a lame character, but they did the best they could with him, and the end result is not terrible. 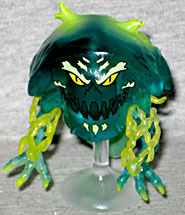 Just consider him a very ornate pack-in to the figure you actually want, and enjoy the fact that the Logo Ghost is so much fun.